Home inspectors get asked this question every day. The answer can simply roll off the tongue---or it may be more like pulling teeth. The reasons for this are as varied as the homes themselves. Some inspectors have fixed fees (no ifs ands or buts), some have fixed fees (unless the house is really really big or really really small), and some have sliding fees depending on how old the house is, where the house is, the square footage, number of bathrooms, number of kitchens, number of attics, number of crawl spaces and so on. I fall in this later group. Next in popularity is the question of: "How long will the inspection take." The inspection always takes as long it takes. I would say that most of my inspections fall in the 3.5 hour range, a condo might be closer to 2 hours, and some big houses have taken as long as 6 hours to inspect. That said, I do try to give some guidelines, and all of the information I can obtain about the property ahead of time is helpful in both determining how long the inspection will take as well as what it will cost. It can be difficult because in spite of the best information, there will always be the two attics inside the one attic, or the crawl space that no body knew about (these are especially problematic because if nobody knew about it most likely nobody has ventured into it in a long time and the risk of significant issues goes up---and the time assessing them. In this picture a shower drain had been leaking into the "unknown" crawl space for years and a main support post was completely rotten away (not to mention the rats---they had discovered the crawl space). When they turn into longer than expected inspections I like to have extra snacks for everyone to keep the low-blood-sugar-boogie-man at bay. Most of the agents that refer me know what I charge and are able to prepare the buyer for the cost of the inspection. The cold-calls from the Internet can be more difficult and I have to spend a little more time educating the caller as to why my (perhaps) more expensive inspection is worth while. Usually by the time I talk to them and they see my sample report on my website I book the inspection. Frankly, someone buying a million dollar home and their primary interest is the cost of the inspection, as opposed to the inspection itself, it is OK with me if they find another inspector. I am about providing as much meaningful information in the context of the short time I am at the home as I am able. 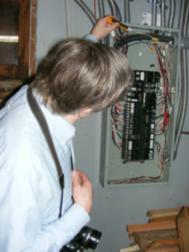 I do my best to give an accurate cost of the inspection when I book the inspection. I have recently started letting the buyer know ahead of time that if there are significant extenuating circumstances the price may have to be re-negotiated. This rarely happens and I would have to say that more often than not to foster good will I don't change the price.